Each year, the Queens Symphony Orchestra presents a series of Masterworks Concerts that serves the residents of the orchestra’s home borough as well as residents of the City and the New York metropolitan area. This continues the tradition of presenting great classical music that began from the time the first baton was raised to the QSO. These concerts include great classical and orchestral pieces from popular composers from around the world. In the past, Masterworks series have featured the work of historic and contemporary Greek composers, American composers, and the great current and historic composers of Europe. Masterworks concerts very often feature opera-in-concert performances with works by Puccini and other great operatic composers and librettists. This series, as one of many presented by the QSO, helps the orchestra to continue its mission and bring the best in orchestral, chorale, and opera to the Borough of Queens. The concerts feature some of the most beautiful music every composed and presented intimately and beautifully. Masterworks concerts were the first concerts presented by the QSO at its founding and they continue to be a Queens Symphony tradition. 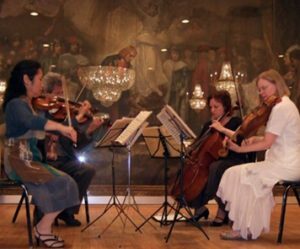 The concerts usually take place at Flushing Town Hall and are a perfect way for those who love the tradition and presentation of classical music and wish to see that tradition continue through a world-class professional orchestra. These concerts are a great opportunity for residents of all ages to take in a great concert in a world-class concert hall free of charge. Visit the Calendar of Events page to view and make reservations for upcoming Masterworks Concerts.